The 5th Annual Deer Creek Open Water Marathon Swim is less than three weeks away! In preparation for the event we will be hosting a free open water clinic on Thursday August 4th at 6:30pm. 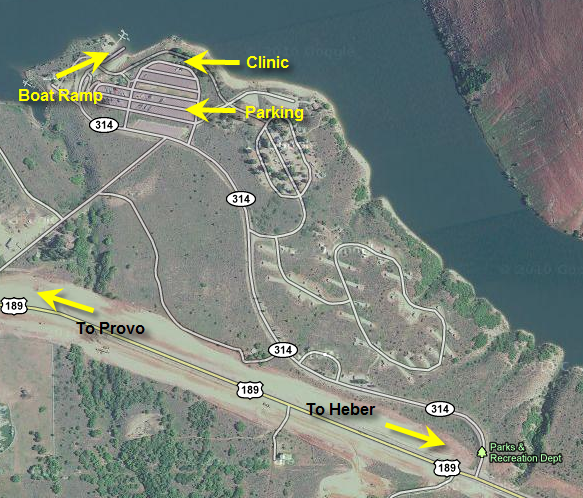 The clinic will take place on the grassy area just north of the parking lot (see map below). We will give an overview of the race and the course as well as cover basic open water skills. Following the instruction we will answer questions and then get in the water for practice. If this will be your first time participating in the event, the clinic will be a good opportunity to see what the water is like and get familiar with the course before the race on the 13th. The water temperature is currently about 70 degrees. The clinic is free, however day use fees still apply. Please be sure to pay the entrance fee as you enter the park. Go east on I-80 until you pass Park City. Take Highway 40 south to Heber. When you get to the south end of Heber the road splits. Take a right onto Highway 189. After about 4 miles you will see Deer Creek reservoir. As you continue on Highway 189, you will pass Deer Creek Island Resort, Rainbow Bay and the Walsburg Group Area. After you enter the park, head towards the boat ramp. You can park in the parking lot east of the ramp (see map). We will be meeting just north of the parking lot on the grassy picnic area (see map).